Graphic which displays a texture as an image. The texture is loaded and cached using TextureManager. This class also performs a crude scissor test to cull images from view, reducing the load on the geometry batch merger freeing up CPU time. Post-initialization that checks for the existence of a parent Actor and the parent Actor's Body, caching the results for use in rendering. Returns whether or not this image has been culled because it is off screen. Marks the texture rectangle as dirty, making ImageRenderer update. This method should be implemented to issue GL draw calls to render the visuals associated with the given RenderNode node. This can be done using the draw calls in Renderer, (i.e. Renderer::drawMesh()), direct GL calls, or some other mechanism. It is up to the user to ensure GL state is correctly preserved as necessary. 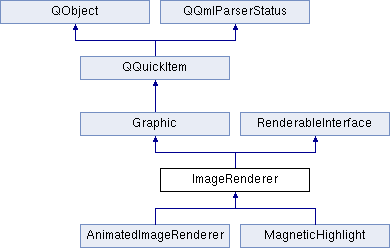 The parameter node can be used to render multiple RenderNodes in a single implementer. Height of this image, as a ratio of the width. Controls whether or not the position, rotation, opacity, and z-depth are cached on first render, and cached copies are used subsequently. This improves performance, but creates stale data if the Actor is moving or transforming. Controls whether or not the Actor's associated Body's Body::active property is linked to this image's visibility. If this property is true, when this image is culled or its visible is set to false, the associated Body will be deactivated. The Body is found through the Actor::body property. Width of this image, in world coordinates. Path to the source texture. Override of QQuickItem's visible property to set visibility. This is done to preserve the convention of using visible to control visibility. Internally we set QQuickItem's visible property, and visible is not virtual, so we cannot override it in the C++ sense. Instead we hide it.